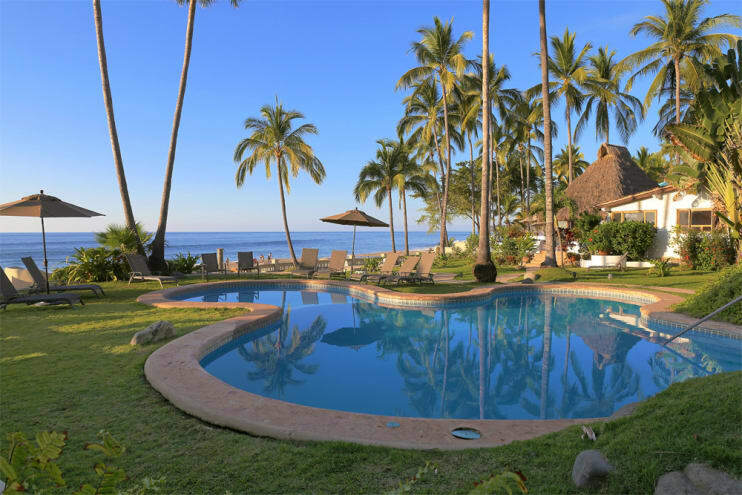 Casa Viviana in Sayulita is a 3 bedroom beachfront villa located in the Las Gemelas beachfront complex on the sought after north side of town. Casa Viviana has a large, private soaking tub on the patio, or you can enjoy the large swimming pool shared by the complex. The six houses of Las Gemelas are built in a "U" shape on the property, and Casa Viviana is the closest to the beach. The house has an expansive patio with a large soaking tub, a large living and dining area that can either be opened up to be outdoors, or enclosed as indoors. The house has a fully equipped kitchen, three bedrooms with king size beds and each bedroom has its own bathroom. You can sit under the palapa and see up and down the entire bay, just steps from the sand. The complex also has a large shared pool that looks right at the ocean. 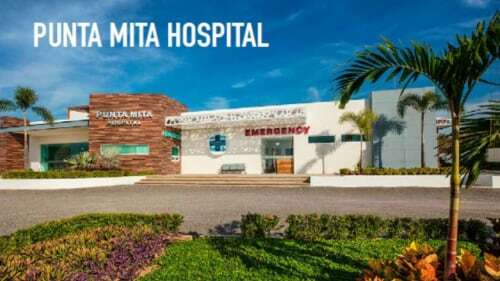 Considered by many the premier spot on the beach, just north of center of Sayulita bay, a short stroll to all restaurants and shops, but just far enough to not hear noise. Please use the contact form to get in touch with any questions and to request a reservation. We look forward to hearing from you and welcoming you to Sayulita! We did have some wonderful family time at Casa Viviana. The location can't be beat and the sunsets are gorgeous. The house is in good shape. Linens look pretty tired. Don't expect plunge pool to get warm like stated on the description. Housekeeping leaves a little to be desired with the price we paid during holidays but it's nice to have on most days. The housekeeper was a bit passive aggressive about the work she had to do. Unfortunately, 11 out of 14 family members staying in Sayulita (half at this house) became violently ill. The norovirus is just so strong in Sayulita. Half my family actually got it last year but I thought it was from something they drank. Well, now we have learned our lesson. We will not be visiting Sayulita again until they make the water plant better. We love the town, but just won't put our family at risk again. Thank you so much for review. My husband and I are the owners of Viviana and we have just taken over the rental management. First, we are so sorry that your family became ill. Yes, it has been a bad flu season in Sayulita. We were down there recently and everyone in our group was fine, so we are hoping that the flu season is over. I will contact our local property manager about the other items that you mentioned. Also, we just received wonderful news! The upgraded wastewater treatment plant has been completed and everything is working wonderfully. You can read the article in Sayulita Life website. Wonderful property and the closest example to paradise I have experienced in a very long time. We (3 couples) had an amazing 10 day stay at Viviana. Our house was the closest to the beach as well as to the pool. We really didn't want or need to leave the property except for our meals which were so close as the local restaurants were right outside the property gates. We spent most of our time in or around the pool or sitting on our deck watching the surf, beach or slipping into our own hot tub on our deck. The house was amazing. Beatrice and her husband Pancho took very good care of us and really made our time there special. Thank you!! Special thanks to Mark for setting us up in this amazing location. Our second visit to Sayulita and the properties he manages and he hasn't let us down yet. This home was everything that we could've ever asked for!! The house and everything in it were in immaculate condition! The house was spacious and very accommodating!! The patio was large and the private pool was an absolute gem (we spent a TON of time soaking in it!!!)! And, the location, well the location couldn't be any better!! It is right on the beach and the perfect distance from the busier part of the beach and the center of town.....not too close, but not too far. Also, the staff (Beatrice, in particular) were absolutely wonderful to work with and really added a special touch to our time there. We can hardly wait to return to Sayulita and stay at Casa Viviana! Casa Viviana's location cannot be beat! The layout of the house with beautiful ocean views from almost every room was extraordinary and being virtually on the beach but with private spaces was fabulous! Very comfortable furnishings with well stocked kitchen for cooking/ bar etc. Although there were so many good restaurants in walking distance that we did not do much cooking! My husband and I took our 3 adult kids- everyone wants to go back next year for longer stay!! We have loved our week at Casa Viviana. 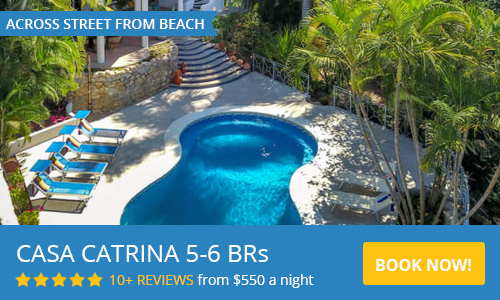 The property is perfectly located right on the beach and a short walk into the main area of Sayulita. The views from the front balcony area are amazing. The house is comfortable, spacious and very well appointed with everything that you need. We hope to be able to re-visit again. We would highly recommend this house, one week was not enough. It is a slice is paradise! Six of us had a delightful two weeks in Casa Viviana. We loved everything about it, including the well-appointed house and beautiful grounds. This is a fabulous location. It's an easy walk into town either by beach or street. But often the inviting pool, the visiting muffin, doughnut, and tamale ladies, and chefs-for-hire kept us relaxing happily at home. Best location! Right on the beach with enough space to relax privately on the deck or yard and easy to step onto the beach to go in the ocean! 5 min walk to town. Beautiful large home that is great for entertaining. I think this is the best property in Sayulita! We could not have been happier with the location and quality of the house. Walking distance to town with picturesque location on the beach. Thank you again for the wonderful stay. I have stayed at Sayulita nearly 10 times and always love it! It is a perfect location as it is close to town but far enough away that the beach is not super crowded. 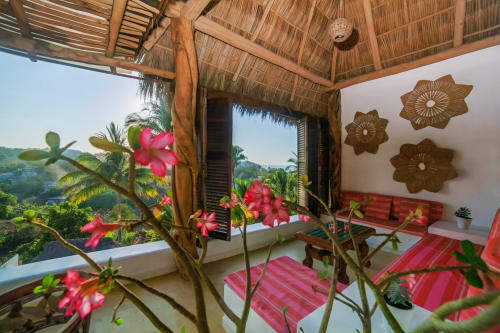 The living area is spacious and the indoor/outdoor palapa is perfect for lounging during the day. The deck even has a private plunge hot tub! The house is in the Las Gemelas complex which has a nice salt water shared pool and plenty of ground to play games. The house itself is very comfortable and well-decorated. We always have such an amazing time at this house; we love watching the sunsets from the deck. I've stayed at other houses in Sayulita but Viviana is by far my favorite! I have stayed at Casa Viviana 8 times. It is seriously the best house in Sayulita. The views and the setting is a 10 plus! We have many memories of taking pictures at sunset on the enormous front patio. The house is amazing with three spacious bedrooms and the added great room is amazing and so grand. The interiors are Mexican traditional with a splash of traditional colors with modern conveniences. Very convenient location to town without being in town! Highly recommend---only don't go when we go! We also accept Venmo. Please note bank transfers will incur a fee). Please check with us if you have any questions. Seasonal reats are in US Dollars - minimum one week rental, Saturday to Saturday. Teresa & Chip welcome you to Casa Viviana in Sayulita! When we are not Stateside, we love our beachfront casa and are sure you will too. We look forward to your visit. If the dates you have selected aren't available and you can be flexible, please send us an email.